Animals that live in stable social groups need to gather information on their own relative position in the group’s social hierarchy, by either directly threatening or by challenging others, or indirectly and in a less perilous manner , by observing interactions among others. 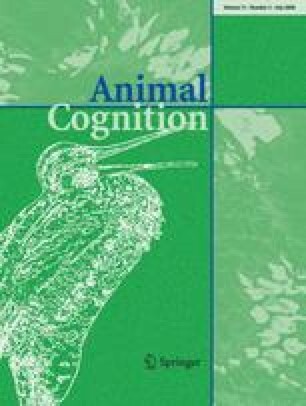 Indirect inference of dominance relationships has previously been reported from primates, rats, birds, and fish. Here, we show that domestic horses, Equus caballus, are similarly capable of social cognition. Taking advantage of a specific “following behavior” that horses show towards humans in a riding arena, we investigated whether bystander horses adjust their response to an experimenter according to the observed interaction and their own dominance relationship with the horse whose reaction to the experimenter they had observed before. Horses copied the “following behavior” towards an experimenter after watching a dominant horse following but did not follow after observing a subordinate horse or a horse from another social group doing so. The “following behavior,” which horses show towards an experimenter, therefore appears to be affected by the demonstrator’s behavior and social status relative to the observer. We thank Bernd Kramer, Beat Tschanz, Fritz Trillmich, Katherine Houpt, Norbert Sachser, and Michael Tomasello for helpful discussion, as well as Elisabeth D`Antoni for language correction and the horse owners for providing us with their horses. The study was supported by an HWP II grant of the University of Regensburg. We declare that the experiments comply with the current laws of the country in which they were performed.